HSP Delivers yet again with this amazing 1/18th scale Pocket Rocket! This small but lively Buggy is firmly aimed at maximum fun and minimum fuss. 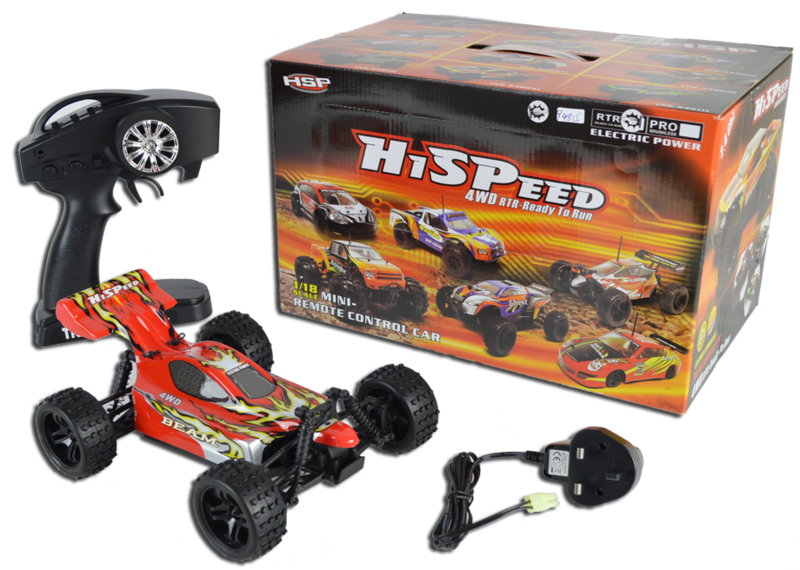 Full time four wheel drive with both front and rear differential, generous ground clearance and no-nonsense 2.4 Ghz radio combine to make this the best all round value electric RC cars available anywhere. Because of its super compact size, it is easy to take with you everywhere and is ready to take on all comers at any impromptu race event! The car is battery powered for silent running and without the need for handling any fuels which are important features for some. It comes with its own removable and rechargeable battery pack and mains charger which gives great performance and run time over and over again. This stunning little performer is equally at home indoors or out and is so simple to use, it makes a perfect choice for younger, less experienced enthusiasts but is so fast that the more experienced among you will stunned by its performance. The package is finished off with a compact and comfortable pistol grip steering wheel controller with proportional control over forward and reverse as well as steering. It is so intuitive to use that you will be driving like a seasoned professional in no time! If all that wasn't enough it also comes in two great body colour schemes to choose from - Red or White! 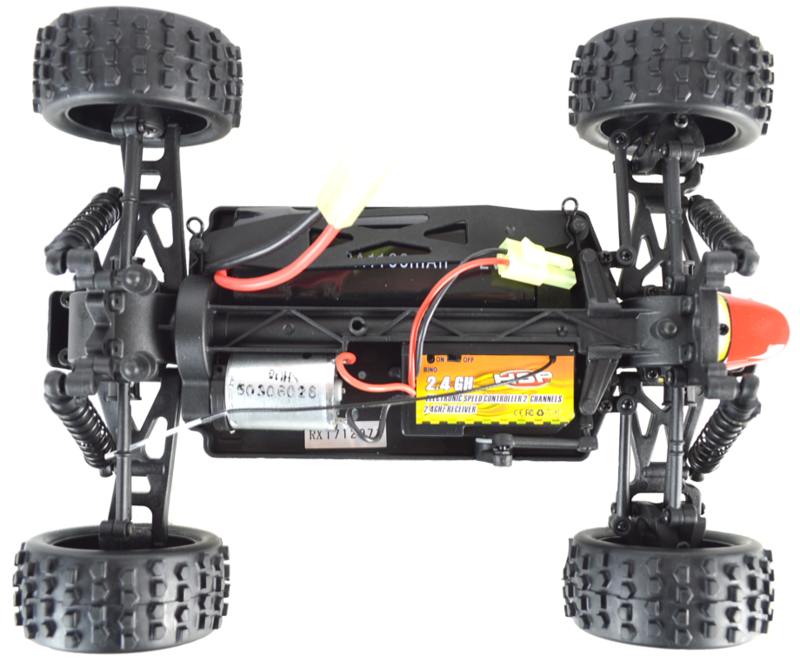 With space at a premium on the chassis, the 2.4 Ghz receiver has been combined with the steering servo and electric speed controller. With an easy access on/off switch, this integrated design really simplifies with the minimum of wiring on show. Battery packs are held securely in the tub chassis, but are easy and quick to remove for recharging using the simple strap and clip system. 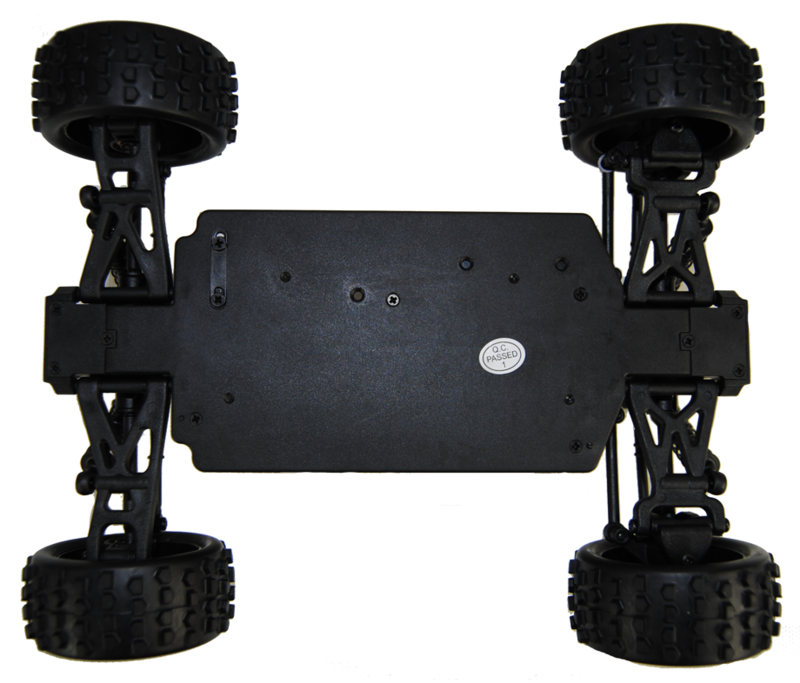 A sturdy plastic chassis featuring counter sunk screws that will protect your model from any rocky or bumpy terrain damage. 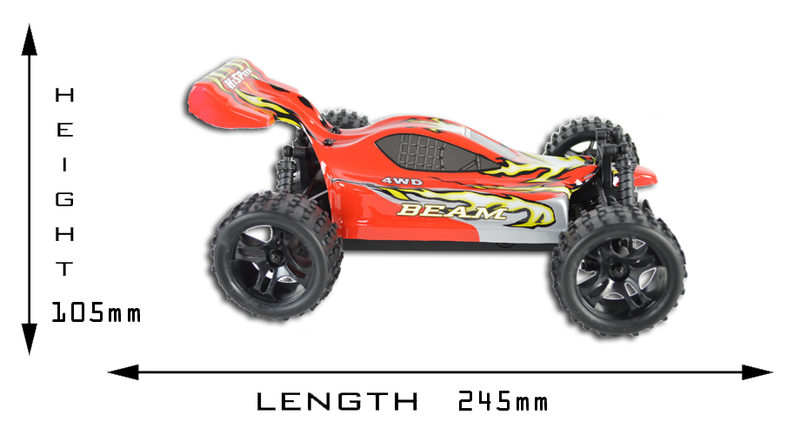 This buggy measures 245mm x 105mm x 175mm, a nice compact size that is easy to carry wherever you go! The four wheel drive system improves off road performance and on road grip. The working front and rear differentials further improve cornering ability. Long pivot ball coil shocks give lots of suspension. 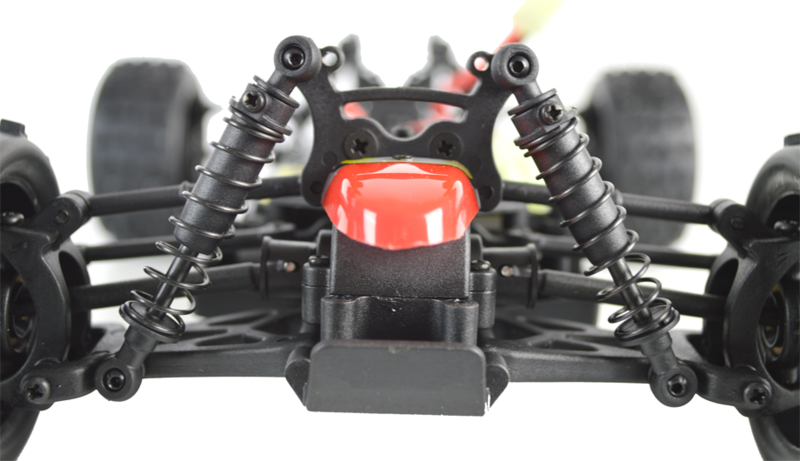 You can choose between two different shock angles to suit the driving terrain. Which cars would be ok for wet conditions then that are not super fast in speed? Hello - thank you for your question. Due to the nature of the hobby, unfortunately we do not stock models which are fully water resistant as many of the engine components are visable and not protected. My apologies if this causes any inconveinience. Hi, if we bought two of these cars for our boys, would they be able to play together or do they run on the same frequency and would therefore interfere with each other? Hi, Thank you for your question. As these models have been upgraded with 2.4ghz, these are able to be together at the same time. Hi, Thank you for your question. Yes, this would be ideal for a 10 year old child This stunning little performer is equally at home indoors or out and is so simple to use, it makes a perfect choice for younger, less experienced enthusiasts but is so fast that the more experienced among you will stunned by its performance. The package is finished off with a compact and comfortable pistol grip steering wheel controller with proportional control over forward and reverse as well as steering. It is so intuitive to use that you will be driving like a seasoned professional in no time!